Update (Jan 25): If you see multiple 'processed through facility at MOSKVA PCI-21' records in your tracking info, that means Russian Post decided to use ground shipping instead of air. That's a usual situation for US and Canada destinations during the holiday season. Aug 29: Reservation payment instructions were sent. Nov 7: Bare PCBs arrived. Assembly will be started in a few days. Dec 12: Assembly completed, now preparing for shipping. Dec 15: First invoices were sent. TL;DR: This kit allows you to install 1080p IPS display in your lovely ThinkPad X220 or X230. See a long story in this thread. The old guide is available here. Make sure you read the whole manual to avoid his mistakes! The price is $58 + $6 worldwide shipping. Free local pickup is available in Moscow, Russia. I can install the kit in your machine for a fee, but contact me first my email (you can find it in the manual). Before you do this, visit a local repair shop, show them the installation guide and ask for a quote - that might be much faster and probably cheaper. IMPORTANT: Ask the seller for the exact model that you need! Q: Does this mod require soldering? Q: Does this mod affect left-side DisplayPort connector? A: No. 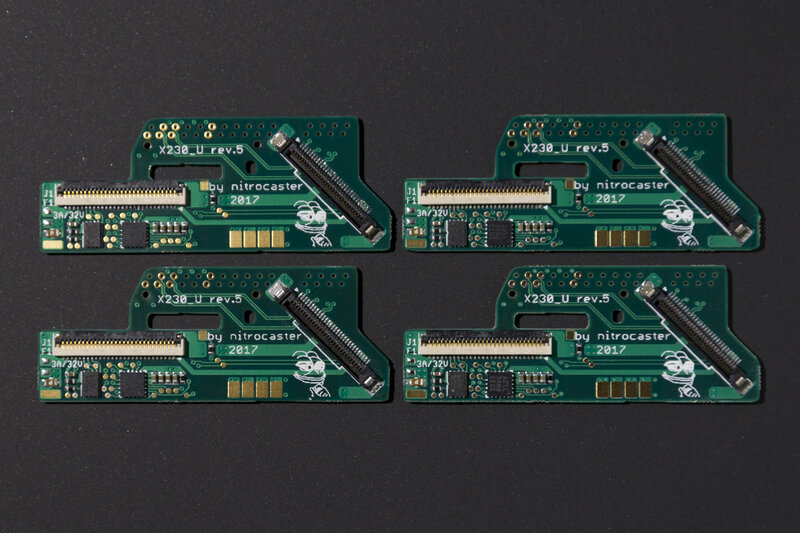 The adapter board connects to Dock DisplayPort #2. Q: Does the brightness control work? A: Brightness control does work in dual display mode: FHD display + fake display for brightness control (appears as "Dummy Display"). Otherwise brightness is fixed at 100%. Linux users can apply this kernel patch. BIOS (or coreboot) patch is required to overcome this limitation (I'm working on it sorry, I don't have time for that). Q: Does this mod support WQHD displays? A: No. 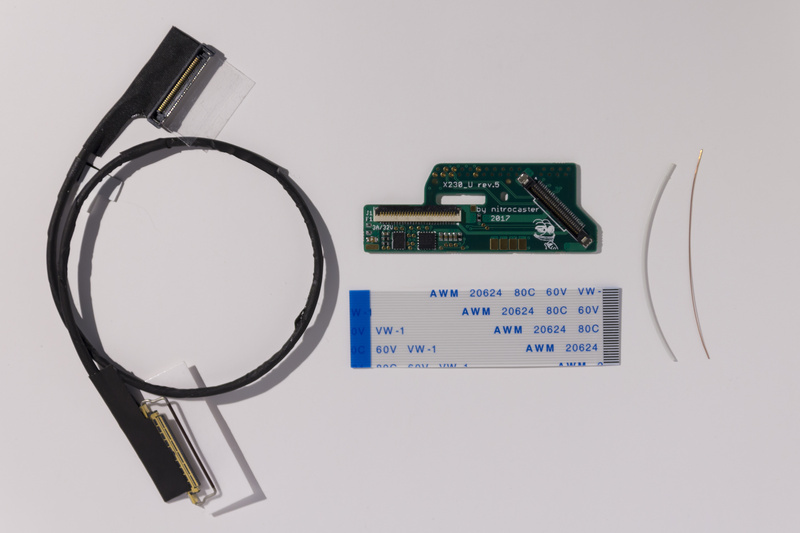 WQHD requires 4 DisplayPort lanes while the adapter board (and the eDP cable) provide only 2. Q: How does it affect battery life? A: A FHD display itself consumes about as much power as a stock one, but active LVDS interface (which is used for brightness control) consumes additional 1W. Q: Can I use docking station with this mod? A: You can use UltraBase Series 3 without any problem. However, when using Mini Dock Series 3, the internal display will go blank (and second DVI/DisplayPort on dock will be non functional). 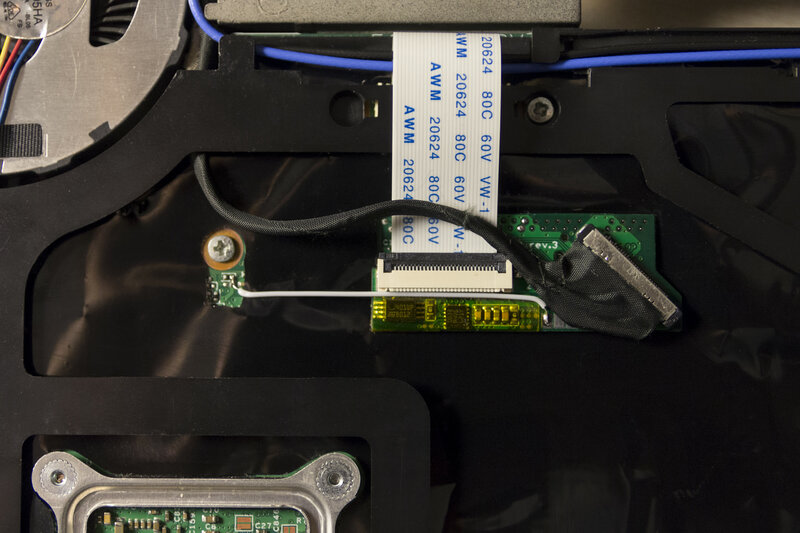 To overcome this issue, you can tape a row of DP#2 pins inside the docking connector. Q: Does this mod support X220T/X230T? A: No. 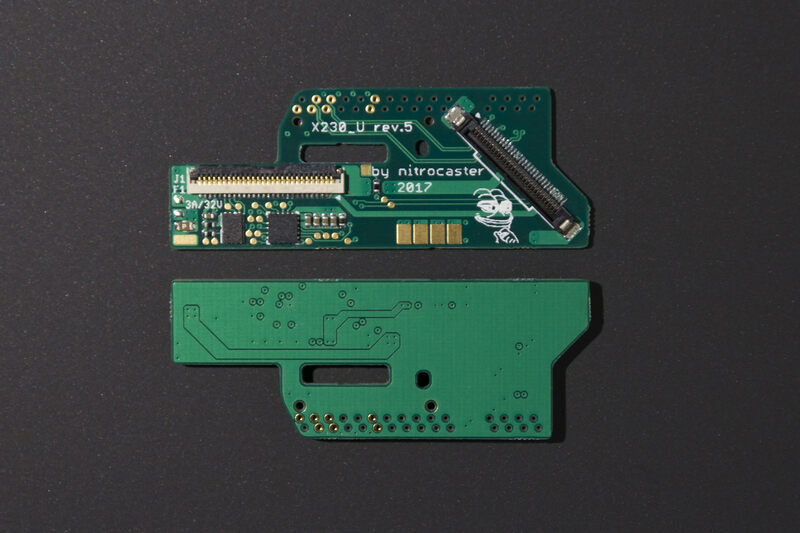 It's technically possible to design special version of the adapter board that would fit in tablet, but then you'll need to replace the screen. Which, again, is technically possible, but not really doable. A: The kit is shipped as small registered package (you'll have a tracking number). Q: I have just submitted the order form, what should I do now? A: Patience! I'll receive your order and will reply with payment instructions if there's a kit available for you. I ship in 2-3 days after you make the payment and send you a tracking number. Remember to check your spam folder because sometimes my messages can end up there. You'll have 7 days after receiving the payment instructions to make the payment. Q: I have submitted my order around the start of 2nd batch, but have yet to receive a message or confirmation. A: That means your turn is yet to come. Watch this thread for news and check your mailbox regularly. Q: Does any of tested displays have PWM/flickering backlight or ghosting/burn in issues? A: No and no. All 3 displays use flicker-free backlight and don't show any ghosting. 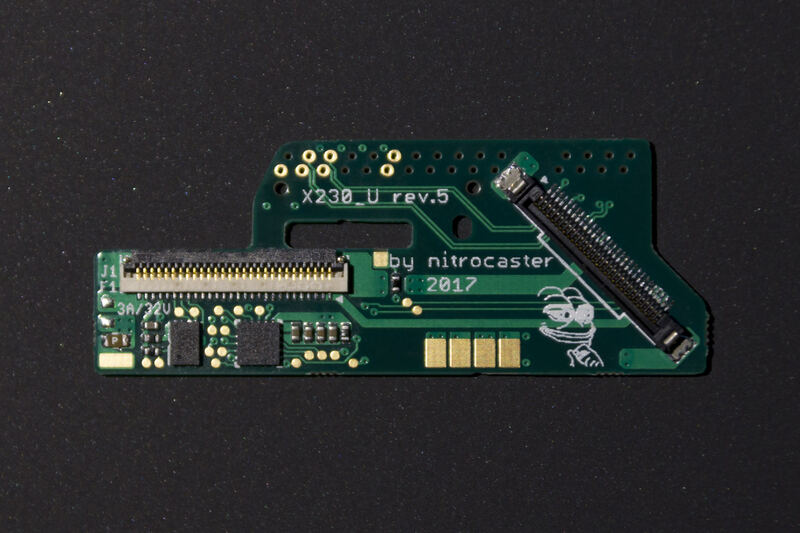 Q: Why is Pepe on the PCB? A: Smug Pepe depicts the feel I got when I first made FHD display work in my X230. Then it just occurred to me that it would be a nice touch to put Pepe on the board, and so I did. Last edited by nitrocaster on Sat Apr 13, 2019 4:38 am, edited 119 times in total. Another piece of genius engineering. Woohoo, can hardly wait! Thanks again for your incredible work. Thank you very much, nitrocaster! Will this be a registered shipping or ...? jp776 wrote: Will this be a registered shipping or ...? Yes. I updated the FAQ. Attached a poll on X220T/X230T. If there would be enough interest I'll do the business. Submitted! I've been following your work since day 1! Sent in the form for 2! Real excited! I'll gather the orders and ship a batch of parcels in ~2 days. In that case the whole post office is gonna hate me for just a one time (until the next batch, of course). Interest submitted for two kits! Thanks again for your sharing this in the community! My X230 i7-3520m will be delivered today, and I have just registered on the order form. In less than 24 hours! I'm preparing 43 kits for shipping ATM. Additional 13 kits will be ready in a few days. As before, I'll reserve some of them for russian buyers. And maybe put the last kit on eBay. mini question: the wacom hardware would remain active with the new high resolution? or does the FHD upgrade renders it unusable? Never got an email from you Was I too slow? Was I too late if I did not receive an Email? Botticelli wrote: Was I too late if I did not receive an Email? If you didn't receive payment instructions so far, you're either in the 'delayed kit' list (13 kits have to be assembled by the end of this week) or in the waiting list for the next batch. Have you seen these displays side by side? Panelook says the SPB3 is 6 bit color at 400 nits, and the SPB4 is 8 bit at 300 nits. Do you think these are accurate and is there a big difference in brightness between the displays? 400 nits is in the range of outdoor usable, do you think that's the case? Just clicked on the link. I think I was one day too late. It looks like the link for Intel Dithering Settings in the manual is broken (http://kawamoto.no-ip.org/henteko/myapp ... 23ditherig) is there alternative d/l link? Thanks. timsydney wrote: Have you seen these displays side by side? Panelook says the SPB3 is 6 bit color at 400 nits, and the SPB4 is 8 bit at 300 nits. Do you think these are accurate and is there a big difference in brightness between the displays? 400 nits is in the range of outdoor usable, do you think that's the case? Panelook may be wrong since there's no datasheet for SPB3. To make a fair comparison I would have to get them side-by-side. I have SPB4 in my X230, but SPB3 was sold to local buyer. We meet sometimes, so I hope to catch him with his modded X220 and make a comparison. systema wrote: It looks like the link for Intel Dithering Settings in the manual is broken (http://kawamoto.no-ip.org/henteko/myapp ... 23ditherig) is there alternative d/l link? Thanks.